Have you found an online vendor selling Doorly's 5-Year? Dry, wth just a little sweet vanilla, oak, and enough of an alcohol afterburn to keep it from being great. But for $12 you get a very decent Seale rum, and that's better than anything else in this range. I have been reading the praises of Doorly's rums and finally am now able to try some thanks to Total Wine and More in Jacksonville. Had to drive over 3 hours to get some. No one locally could obtain any. 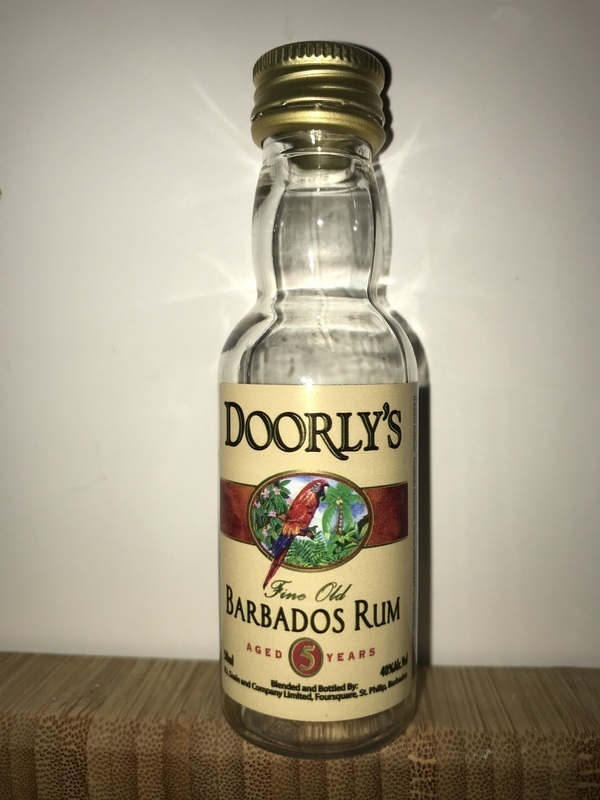 I will start with Doorly's Fine Old Barbados Rum Aged 5 Years. My bottle differs a great deal in appearance as compared to the bottle on the RumRatings list. I uploaded a photo I took for comparison. The rum itself is a nice amber. The aroma in my snifter is quite nice. Has a sweetness to it. The flavor also imparts a nice sweetness. However upon a little investigation I find that testing was done on this rum and it was not sugared. So the sweetness is natural. First off, this rum comes from the R.L. Seale & Company. I've recently read a lot about Richard Seale and all of it good. One thing is apparent is that he is very particular about being transparent concerning his rums. I respect that. The label says "Aged 5 Years" not just a "5" or "5 years". It is very specific. And also from what I have read concerning Mr. Seale is that the rum you get is the rum that came directly from the barrel...no additives...no sugaring. I have to respect that. I hope to meet him someday and shake his hand. Secondly, it seems that the bulk of the rums I like best come from two places: Barbados and Martinique. Don't know why. It is what it is. The sweetness is far from overpowering and there are oak undertones carrying it all along. This is a quality rum. And the $12 USD I paid for it qualifies it as a heckuva bargain. Versatile as well. This rum needs to be mandatory at all bars especially tiki bars. Sipper...mixer...anyway you want it, you can't go wrong. Dadgummit! I want daiquiris made with this. ASAP! R.L. Seale and Company...I salute you! Bought at Total Wine for $10. A really nice rum for the price. Vanilla and caramel notes on the nose with faint dry fruit and some alcohol . This rum is nice and smooth on the palate with vanilla and caramel coming through the dry fruit comes in more on taste then smell. Long finish with a minimal burn. I love what Seales has done at the Four Square Distillery and can not recommend their products enough. A Bajan friend and I tried this. He told me the story of when he grew on the same street as Mr. Doorly. He said he remembered thinking he was a very plain man, and he must have made a very plain rum. Couldn't agree more. I like Bajan rum tremendously, but this is nothing special. $22. for a 1.75L...haha its a total fricking steal! Much like you would expect from a younger Doorly's 8 or younger RL Seale's, it definitely has some of the same flavors while having more expected burn that isn't overkill. Drink it on the rocks and problem solved, takes the edge off and still has great flavora of vanilla, honey, banana, and sugar cane grass. Definitely bringing this to the family beach house this summer. Light Bajan Rum and had a fresh un-open bottle which require some breathing. Pleasant creme brulee and toffee aroma. Nose finish with aroma of chocolate cookie and light woody-ness. On nose, light caramel with good fresh fruits flavor such as plum. Minty and woody yet taste drier compare to nose. It's dry yet fruity on the finishing with fresh berries (strawberry). I'm a fan of a rum with character. This one has a light hue, no depth to it. The taste confirms this, I taste alcohol and very little else. Fans of gold rum should maybe disregard this review, everything about this is mild; look, smell, taste. its not a sipper, not pleasant on the palate imo, tolerable with a couple rocks. I usually mix my cheaper rums with a coke, it was an ok mix for the buzz, I guess. Its cheap, i'm not disappointed, but I expected more from doorly's as I speak highly of their 12 year. Its ok.
seriously, no nose, no taste, no aftertaste. i was expecting something along the lines of typical bajan rum, such as plantation barbados 5, but this came nowhere near. I could only feel alcohol. very thing and a lot of burn. Bought this after trying at the distillery. Smooth finish but not the best for sipping, although the value for money is excellent. Perfect rum for corn and oil mix. After first smell this Rum lets you to expect more. Unfortunately the taste is closer to flavoured vodka than rum. Drinkable with coke. In aroma: candied fruit, woody, weak, a little fresh and mysterious. Burns the palate and the throat, sweetness, sharply in the throat, the tongue grows numb, woody, bitter, burning sensation definitely.Taste is severe. In the aftertaste is a cream-brule, something confectionery, alcohol burns, the head is calm, but it's hot. Than a rum this age has any right to be. It’ll definitely not disappoint when you need an aged Bajan on budget. It’ll gladly take a backseat beautifully if you’re making ‘gentle’ cocktails. Along with the Macaw It’s a pantry rum. Sugar: 0-5 GPL. Aromas and tastes of vanilla, oak, a bit of caramel and spices. A bit of a burn on the palate but nothing to make you cringe. There is a sweetness in the rum and I know that R.L. Seale or Doorly's doesn't add anything to their rums so it's a pleasant surprise. Well balanced rum that you could sip if there was nothing else but I suggest a piece of ice. It mixes really well and is well priced. Worth having in your bar. Vôňa spočiatku alkoholová, po čase vanilka, chuť veľmi príjemná, hrejivá. Rum z Barbadosu, teda rum - žiadne aditíva, bez cukru. Môj prvý rum, ktorý mi veľmi zachutil a s ktorým budem porovnávať ďalej. This is a simple mixing rum. There are no harsh, overpowering flavors. It's quite smooth considering its age, but, ultimately, it's too light-tasting & simple to be much of a sipper. Mixer only. Ένα μπουκαλάκι το οποίο καθαρίσαμε "εν μία ριπή" μαζί με τον φίλο μου τον Μ.....ο στην συναυλία των Artic Monkeys !!!??!!! Ναι ..... δε ξέρω αν η γενικότερη ευφορία βοήθησε ώστε να απολαύσουμε στο μέγιστο αυτό το ρούμι ..... Σίγουρα όμως είναι ευκολόπιοτο, με ωραία αρώματα, μέτρια ένταση και επίγευση. Αν προσπαθήσω να το παρομοιάσω με κάποιο , τότε σίγουρα θα το παρομοίαζα με το Plantation 5 .... Καλή επιλογή στα 25€. As with all of the Doorly's rums, this is very good. Essentially the difference between this and the 12 year old is that this is less complex and has less going on. It's still very good - especially for the price. It has a held back natural sweetness (no sugar, it's R L Seale!) and a little bit of fruitiness (not nearly so much as the 12 year old). There's a bit of oak too and not much burn - just a really nice glowing warmth. Strangely, I found that it had more on the nose thatn the 12 year old, but certainly less on the fade and tongue. The only downside is that I'd marginally prefer a Havan Club Anejo Especial for just a little less and certainly a Chairman's Reserve for a fraction less - but that's no sin, they are great rums...and this is pretty good too. Sweet enough rum. Slighty less compared to the XO. It'll do. Definitely more of a mixer type of drink. Pare best with a ginger-ale and second best a cola. Very mild rum with vanilla and banana flavours. Not easy to get in UK supermarkets so price point was mid range. Drinkable and good mixer, but to be honest I prefer more complexity.